The heroes of Only Fools and Horses are making a comeback in a musical version of the classic sitcom which will will run at London's Theatre Royal Haymarket from 9th February for an initial booking period to 22nd June 2019 with opening night on 19th February. 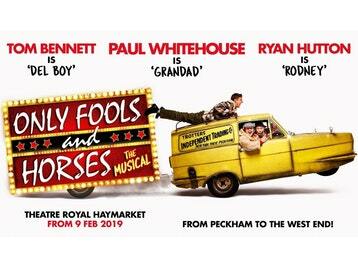 Initial casting includes Fast Show legend Paul Whitehouse playing Grandad in the revival, with Tom Bennett (David Brent: Life on the Road) as wheeler-dealer Del Boy Trotter and Ryan Hutton (I Am Vengeance) as his hapless younger brother Rodney. Featuring material from the TV series, the musical takes a a trip back to 1989, where it's all kicking off in Peckham. While the yuppie invasion of London is in full swing, love is in the air as Del Boy sets out on the rocky road to find his soul mate, Rodney and Cassandra prepare to say 'I do', and even Trigger is gearing up for a date (with a person!). Meanwhile, Boycie and Marlene give parenthood one final shot and Grandad takes stock of his life and decides the time has finally arrived to get his piles sorted! Most of the supporting characters will also appear, including Raquel, Cassandra, Boycie, Marlene, Trigger, Denzil, Mickey Pearce, Mike and the Driscoll Brothers. Though no Uncle Albert, who did not appear in the series until the departure of Grandad.